This variety of summer squash is very popular, easy to grow and fast maturing, producing a generous crop of delicious and delicately flavored fruits. Plants are compact bush type bearing handsome oblong dark green fruits. Plants continue to produce tender, vitamin rich fruit until frost if all fruit are picked before they mature. Fruits are best picked when they are 6 to 8 inches long. Cooked like summer squash, used fresh or fried in butter. 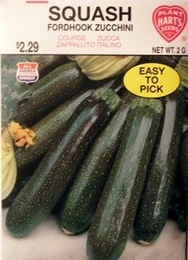 4lbs of Zucchini seed needed per acre. Average Zucchini yield per acre -494 bushels.